Warm days foretell the end of winter, and for those who enjoy the twists and turns of driving picturesque roads, spring is the time for motoring pleasure. A visit to Bratislava is definitely the most enjoyable when the days get longer and road surfaces are warmed by the sun. Bratislava is known as an automotive superpower – the new European Detroit. When we last visited the city, we stumbled across some amazing roads, perfect for any automotive event or commercial shoot. Together with Martin Jesny, a Slovak expert motoring journalist, we have compiled a list of the area’s most interesting routes for a drive. This mountain pass near Bratislava is known for hill climb races and praised by petrol-heads for its smooth turns, which allow drivers to take their vehicles to the limit. At a length of 14 kilometres, the mountain pass leads all the way up to the Pezinská Baba ski slopes at an altitude of 595m. The road is a popular venue for mountain speed runs and other motoring competitions and test runs. The racing drivers usually have to tackle 19 challenging turns over a distance of 5.1km. At the top of the Little Carpathians mountain range you are greeted by a mountain hotel with a substantial culinary offer. This road, on which the region’s best drivers hone their skills, is also an excellent choice for organisers of car reviews and other kinds of promotions. With penalties for speeding getting stricter and more expensive, visiting a racetrack seems like the only sensible option to test out your iron steed. In a safe and controlled environment, drivers get a chance to test their driving skills and see how far they can actually take their vehicles. According to motorsport standards, the almost new Slovakia Ring is one of the most popular race tracks in Europe. Together with a testing course, the track was built between 2008 and 2010. Since then, the excellent location and design of the racetrack, which lies approxametely 30 kilometres east of Bratislava, has been attracting professional racing drivers as well as amateur enthusiasts. The Slovakia Ring regularly hosts famous car brands that carry out testing of their new vehicles. For a complete contrast to driving on a track, take the relaxing and romantic drive from Bratislava to the Danubiana Meulensteen Art Museum. You could make your way to the museum by boat along the Danube, however, lovers of picturesque car journeys are certain to enjoy the scenic drive much more. This special venue, full of interesting sculptures and paintings. has impressed car manufacturers on many occasions; after all, it is one of the most photogenic locations in this part of Europe and architecturally one of the most interesting. The atmosphere breathes modernity, perfect for top-notch car launches. Devin Castle holds a lot of meaning for the people of Slovakia, as it represents the forming of the Slavic nations in the Great Moravia area. The castle withstood all the Turkish invasions, and belonged to various noble families until it was destroyed in 1809 by Napoleon’s men. Today, the ruins are a national treasure and an open-air museum, from which views stretch all the way to Vienna on a clear day. 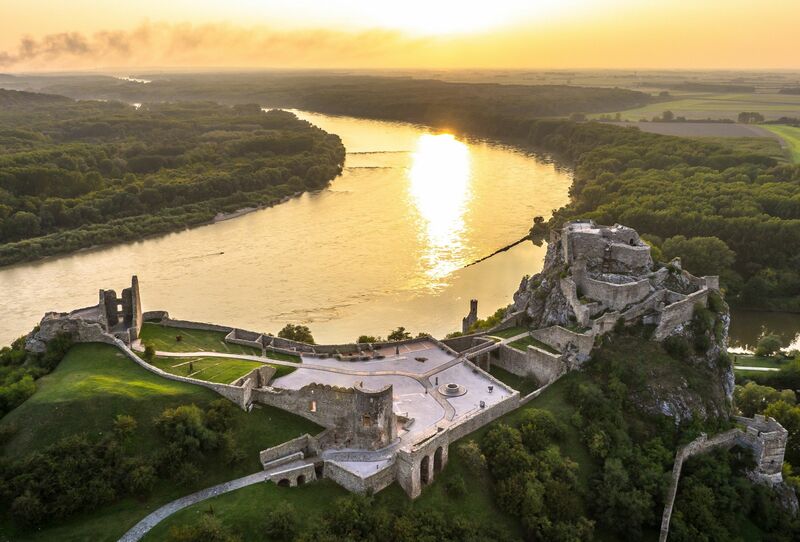 The castle is only 12km from Bratislava, a route which could serve as an amazing backdrop for a film. There are not many European capitals that have a geological feature such as the Sandberg in their near vicinity. In the area of the Sandberg, paleontologists discovered the fossils of more than 250 extinct animal species, dating back over a hundred million years. The entire area is registered as a national park. The people of Bratislava affectionately call this sight ‘The Sahara’, which today serves as a popular venue for car photoshoots. The incredible geological history, amazing views at the top of the Sandberg and the opportunity to visit the nearby Devin Castle make for a unique experience. Road connections are very good and the traffic infrastructure can. for the most part. be marked as very user-friendly. The driving culture is at a high level, but you definitely should abide by the traffic regulations, as there are many traffic controls. Roads in the city, as well as in the surrounding areas, are in good shape and the flexible city authorities will be of great help should you require privatisation of part of a road for an event.